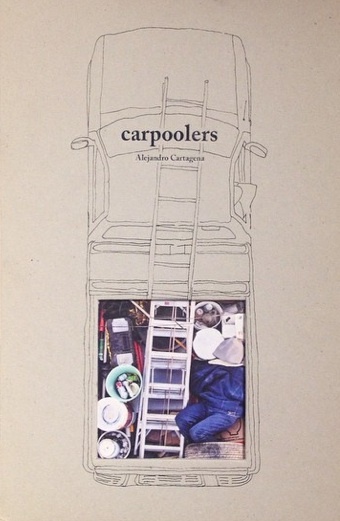 Book Review Carpoolers By Alejandro Cartagena Reviewed by Colin Pantall Alejandro Cartagena made his Carpoolers pictures between 2011 and 2012. It’s a series of Mexican workers getting to and from work in the back of pick-up trucks. They sit, they lie, they sleep surrounded by the tools of their trades in trucks that are isolated from above. Self-Published, 2014. 112 pp., 110 color illustrations, 8½x13¼". Alejandro Cartagena made his Carpoolers pictures between 2011 and 2012. It’s a series of Mexican workers getting to and from work in the back of pick-up trucks. They sit, they lie, they sleep surrounded by the tools of their trades in trucks that are isolated from above. Cartagena photographed the cars from a pedestrian bridge above a six-lane highway that led to the wealthy suburbs of Monterey, a continuation of his fascination with the relationship between the urban and suburban, between the rich and the poor, the dynamics of a place where the workers are trucked in by the day to build the houses, tend the gardens and clean the swimming pools of Monterrey’s suburban rich. The series was very good. People remember it for some reason, possibly because it’s one of those projects that is so direct and simple; the I-could-have-done-that project. Which invites they yes-but-you-didn’t response. Now Cartagena has self-published the series as a book. The book’s called Carpoolers, too. I didn’t have high expectations of the book. I thought it was going to be page after page after page of people lying in the back of cars. And strangely enough, that’s exactly what it is. Carpoolers. By Alejandro Cartagena. Self-Publish, 2014. But Cartagena has done it absolutely beautifully, making the series fit the book form from the front cover on, adding details of road and sky through image and design that make the book something very special indeed. The cover is plain cardboard with the title, Cartagena’s name and the outline of a truck seen from above printed down the middle. A window’s been cut out so we see what’s going to come; people lying in the back of pick-up trucks. Cartagena is already grabbing our attention and pointing it to the salient points; what and who is in the truck. There are gardeners, plasterers, electricians and people of other working persuasions. It’s small trades in the back of trucks. But then there’s a young-looking guy in a grubby convertible, and a man on a scooter. They relieve the tyranny of the series. Gatefolds and pictures that are cropped one page into another do the same, adding a flow to the book so it has variety and a dynamism that a strict typology wouldn’t have. The people in the trucks sit upright or sleep. Sometimes they’re lying back and looking straight up at Cartagena’s camera. A couple of young men moving furniture (there’s a circular saw in the truck so they might be joiners) grin broadly from the back of their white pick-up. Other people text and read. More punctuations occur; a view of a road sign, a series of shots of blue sky crossed with telephone wires and dotted with helicopters. We see blurred dashes of the undersides of overpasses and bridges. Cartagena is giving us a psycho-geographic view of the road, a carpoolers’ perspective that puts the viewer on the bed of the truck.